This recording has been in Phono-Suecia's lists for upwards of twenty years; at first as a vinyl disc and since 1986 as a compact disc. The CD format has been kind to Pettersson permitting most of his single movement symphonies a single uninterrupted listening experience. This has been the upside. The downside is that the medium continues to deny us transfers of certain pioneering LPs. The lacunae are Comissiona's 2LP version of the Ninth Symphony (Philips), the same conductor's DG (or Polar) LP of the Eighth (Baltimore SO) and Okko Kamu's Norrkopping SO version of the Sixth on CBS. What to say about the Fourteenth Symphony? It is, as you can see, a work lasting over three quarters of an hour. It was written the year after the Second Violin Concerto (also on Phono-Suecia) and the year before the Sixteenth Symphony (the one with a solo part for saxophone). 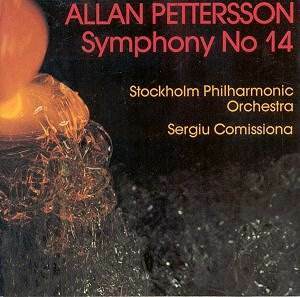 In the same year Pettersson also wrote the Fifteenth Symphony. 1978 was the twenty-fifth year in which he suffered crippling and painful arthritic illness. From the first instant you are left with no doubts that this is a serious work - no divertimento in symphonic garb. It protests and laments, screeches and bellows, batters and sings. Tension rises and is sustained almost unbearably and then slackened off into great valleys of Bach-like arioso passages. I am not sure how well it all coheres and the ending strikes me as suspect. However there are some extraordinarily excoriating writing along the way. The impressions left are of an epic painting unfolding in aural colours. There is nothing belligerently atonal about the work but racking tortured conflict leaves its mark on the tonality. The recording lucidly exposes the detail which is critical in a work that would otherwise retreat into a foggy maelstrom. Among the very late works it is the one that speaks with superior conviction. Though ending in a far less inspired way it deserves to stand in the magisterial company of the Seventh Symphony. The competition comes in the form of CPO's recording of the 1988 German premiere by the Berlin Radio SO conducted by Johan M Arnell (CPO 999 191-2). The Comissiona is in DDD and the Arnell, surprisingly, in ADD. The two recordings are pretty equally matched from an interpretative point of view with a shade more character and colouring from Arnell. On the debit side the CPO taping, though very vivid, is also prone to some hiss.